The second season of the Tales from the Archives moves on. 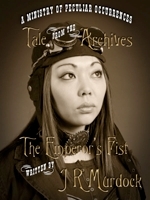 Today we released The Emperor’s Fist by J R Murdock. We now have a complete set of J R’s after J R Blackwell’s Women of the Empire was released a few weeks ago. Mr Murdock’s story is set in China, somewhere the Ministry stories had yet to venture. While Ms. Blackwell’s story reveals some unfortunate details of her namesake’s meeting with Wellington Books. In addition a new collection of Tales for your aether devices has come out, bringing the total to four. Please visit the stories page to examine the wealth of adventures and mysteries our guest authors, as well as our two journalists Ballantine and Morris have produced. They are available for all aether formats. In addition, there are plenty more to anticipate in the coming weeks! ← Previous Previous post: Disasterpiece Theatre Returns… Unfortunately.